Obverse: Titus the bringer of peace in toga, left, holding olive branch in outstretched right hand, seated on stella curulis, under which is a globe, to the left and right captured weapons. Text around DIVO AVG T DIVI VESP F VESPASIAN. SC in exergue. Reverse: An accurate depiction of the Flavian Amphitheatre (Colosseum), seen from slightly above. The exterior includes statues between the arches on the second and third levels and enough of the interior to show a row of seats and in the middle the imperial throne in the half circle. To the left is the conical fountain known as the Meta Sudans and to the right a two-storey portico. 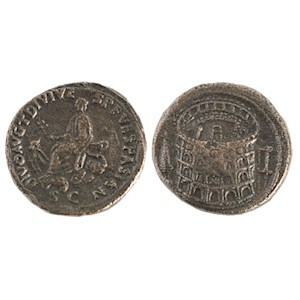 History: This coin not only celebrates Titus’ successful military campaigns on the obverse but also the opening of the Flavian Amphitheatre with the first games lasting 100 days on the reverse.